You can read more about the criteria for nominating a project or individual below. Nominations are accepted year-round with the "award year" rolling over in April each year. We see the awards program as a fun, exciting way to celebrate our profession. 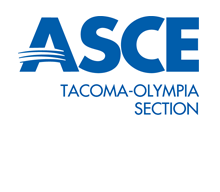 Our section membership is full of great engineers and our geographic area is positively teeming with noteworthy projects. The awards program is also a great way to give press to all the great work that we are doing. If you'd like to get involved, there are a number of ways to help out. You can put together a nomination package for one of our award categories! You could also help us out by volunteering to evaluate nomination submittals in the springtime. Or, most importantly, you can come out to our annual event in May and join us for the presentation of awards. The nominations process is ongoing throughout the year. To be considered for an award, a complete nomination package must be received by the Awards Committee by the last week of April. The section sets the exact date each year - check the application instructions for more information. Applications are screened for completeness by the committee prior to acceptance. The screening is not instantaneous - so don't wait until the last minute! Maintaining this deadline is important so that winners can go on to be considered at the regional and national level, and be present for our awards ceremony in May. You can find all of the various resources and forms you need to make an application in the list below. If you have a complete package and you would like to submit it for review, click here to send it in. Click here to view the detailed scoring criteria. Nomination packages are evaluated and scored by the Awards Committee. The Awards Committee is chaired by the Section's past president and staffed by volunteers from the section and members of the Past Presidents Committee. If you would like to help us out this year in evaluating nomination packages, contact us. The Section holds its annual awards banquet in May each year. The banquet is used as an opportunity to present awards to winners and share in an evening of celebration for our profession and the hard work and accomplishments of the year prior. In addition to presenting awards for each of our three OPAL categories, we take the opportunity to recognize members of the section who have achieved Life Member status in the year preceding the banquet. We encourage all of our members to attend the banquet as an opportunity to connect with our section's most prestigious engineers and to see what award-winning service looks like. If you'd like to attend the ceremony, head over to our events page to sign up!